Parks and Conservation Resources (PCR) manages the county's environmentally sensitive lands using sound resource management practices that promote the quality of ecosystems native to the county. Management practices focus on maintaining or enhancing the natural biological diversity. Management areas are small properties that protect natural and cultural resources, but do not typically support established public uses. Public activities on Management Areas are governed by the Municode - Chapter 90 - Parks and Conservation Resources. This Management Area is approximately 33 acres in size and is subdivided into two parcels that lie on either side of Belcher Road in Largo. Located near Safety Harbor and connected to Old Tampa Bay, this Management Area is approximately 53 acres and includes two wading bird rookery islands. Since 2000, nearly 160 acres of environmentally sensitive salt marsh, mangrove islands, and upland communities along the Anclote River in Tarpon Springs have been purchased by Pinellas County. Located in Tierra Verde, this Management Area is nearly 340 acres of mangrove swamp, coastal hammock, and oligohaline ponds. Located at the southwestern end of Lake Tarpon, this 86-acre Management Area consists primarily of cypress swamps with some upland hardwood forests. This nearly 24-acre property was donated to the County in 1987 as conservation land. The parcel supports forested wetlands with artificial ponds and canals nestled among several residential communities west of East Lake Road. Nearly 200 acres of pine-dominated uplands and coastal estuaries are protected within this Management Area located near the north end of Boca Ciega Bay in St. Petersburg. This approximately 25-acre Management Area consists of two small islands and surrounding waters, and is located in the intra-coastal waters south of the Dunedin Causeway. This linear tract comprised mostly of forested uplands occurs along the northeastern edge of Lake Seminole and is not connected to the County's Lake Seminole County Park. Located on the northeastern shore of Lake Tarpon, this Management Area consists of 42 acres of high-quality forested wetlands. The smallest Management Area at 3.7 acres, it is located on the western shore of Lake Tarpon and protects forested wetlands and other natural communities. This 15-acre forested tract occurs along Long Branch Creek at its mouth into Tampa Bay in Clearwater. Purchased in 2000, this ecologically diverse 76-acre parcel is located in south Tarpon Springs along the Gulf of Mexico. 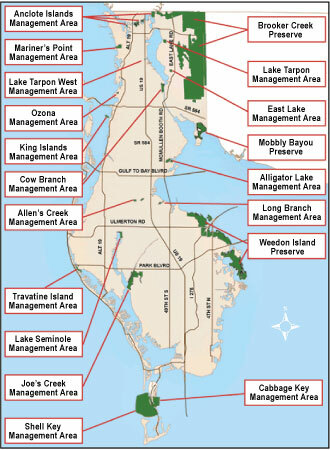 At 8 acres in size, this Management Area protects coastal forests and estuaries. Located at the extreme north end of Boca Ciega Bay near Redington Shores, this Management Area supports coastal resources.